This is the site that will become the Beacon Food Forest. Construction will start later this year. Photo courtesy of Friends of the Beacon Food Forest. The Beacon Food Forest team invite the community to visit the Food Forest site during the Beacon Hill Festival this Saturday, June 2, to imagine what will soon be. Grading of the site will begin in July, after which it will be a construction zone for a while as waterlines, retaining walls, paths, and other features are constructed. This weekend is the best opportunity to visit the site and visualize the future Forest before the mess begins. 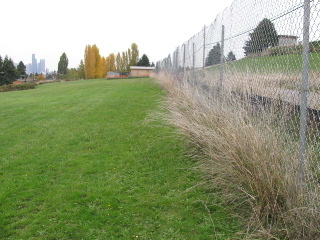 The Beacon Food Forest is located immediately west and downhill of Jefferson Park, on the big grassy slope along 15th Avenue South between Dakota and Spokane Street. Follow the signs along the Park footpath to the tour starting point. Is there a scheduled tour? What time? I don’t think they are scheduled — my understanding is that you can tour any time during the Beacon Hill Festival. So around 10-3 or so. Thanks for asking about the times. We will be giving tours on the hour, first one at 11am , 12, 1pm 2pm last one at 3pm or for however long our vocal chords can hold up.